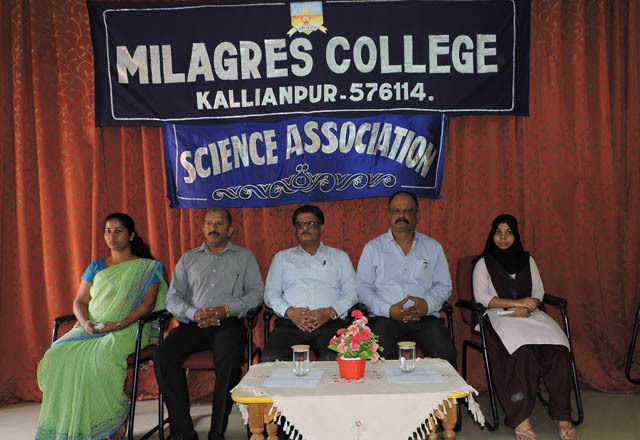 Udupi, 25 Mar: A lecture program and valedictory of Science Association was organised at Milagres College, Kallianpur, here on Saturday, March 23, by Rotary and Rotaract Club of Kallianpur in collaboration with Science Association of Milagres College. The resource person of the program me was Prof Prashanth Shetty Narnad, Associate Professor, School of Information Sciences, MAHE, Manipal delivered a talk on Electronic Revolution. He explained development of Technology through Electronic Revolution. President of the function was Prof Joseph Peter Fernandes, dean of science faculty and HoD of chemistry. President of Science Association Aarzoo gave report of Science Association. Convener of Science Association Arenza Karen Sequeira introduced the chief guest to the gathering. Prizes were distributed to the winners of various Competitions which were conducted by Science Association during the year 2018-19. President of Rotary and Rotaract Club of Kallianpur Brian D’Souza explained about the aim of Rotary and Rotaract Club. Ramya welcomed the gathering. Sofiya delivered vote of thanks. Kavya Pai compered the programme.